Toy trains became popular in the 19th century when trains became a popular mode of transportation and a way to move products from one area of the country to another. Since that time, people of all ages have had a strange fascination with trains, and these toys remain popular with adults and children alike. Lego plastic blocks are quite possibly the favorite building blocks of all time for both children and adults. The Lego Company began in 1949, and their Lego and Duplo blocks are their most popular toys. These are high quality plastic interlocking blocks, and they come with a variety of accessory pieces such as gears, wheels, propellers and more, that allow users to build a variety of toys, from simple buildings to robots, only limited by the users imagination. The Lego Duplo Number Train 10558 Set is not only a fun toy to build, but it provides for a number of learning opportunities. The Duplo Number Train is a cute little toy train that toddlers can build themselves and then play with for hours on end. The number blocks help teach the toddler number recognition while engaging in imaginative play. This set can be used alone or added to other Duplo block sets to build many other toys as well. Reviews for the Lego Duplo Number Train 10558 Set are exceptional, with parents liking both the functionality and the price of this cute little toy train. Kid’s Destiny offers a number of toys and puzzles to help encourage children’s imagination while having fun. 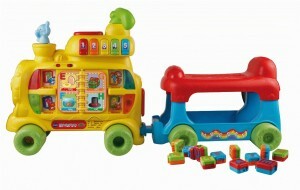 The Deluxe 80 Piece Wooden Train Set is a fun train toy for toddlers that can provide hours of fun and inventive play. The Deluxe 80 Piece Wooden Train Set is a great train toy for toddlers. There are so many different fun pieces that toddlers will be able to build their own railroad. The extra vehicles can be played with as part of the set or separately, giving your child a large variety of different play options. Reviews for this train set are exceptionally good, with parents who purchased this set for toddlers finding this train set perfect for those little engineers. Vtech offers a number of technological learning toys for babies, toddlers, and young school age children. The Vtech Sit To Stand Alphabet Train is a three way play train loaded with features. This is a fun train toy for older infants and toddlers. However, while the description for this train states that the engine can be used as a walker, the light weight and narrowness of the engine makes it ill suited for this purpose. But, once your child is walking on their own, they can still have great fun walking behind and pushing the engine using the handle provided. Riding on it will be especially fun, and exploring all the built in toys will keep most younger children occupied and happy. Reviews for the Vtech Sit To Stand Alphabet Train are impressively positive. However, some parents did express some concerns with this toy that parents should be aware of. One rather small toddler fell between the first and second car, and had the parent not been paying attention may have choked. While this was a freak accident, the problem of infants trying to use the engine as a standard walker is more common with the engine tipping over on top of the child. For these reasons, supervised use is advised. But when parents provide supervised play opportunities, they find this toy train is perfect for their toddler. Fisher Price has long been a popular toy company known for their innovative, fun and colorful toys, designed for infants and toddlers. The Power Wheels Thomas And Friends Tank Engine is a fun first ride-on toy for toddlers who love trains. This ride-on toy train is perfect for young toddlers, providing them with hours of riding fun on their favorite train engine Thomas. It comes with stickers to detail the engine for even more kid appeal. Reviews for the Power Wheels Thomas And Friends Tank Engine are extremely positive, with children loving this fun familiar ride-on train, and parents found plenty to like about this train too. Some parents did state that putting the stickers on could be a bit of challenge since they rip easily, and some parents did complain that this toy had no reverse, while other parents felt it made the train easier for their child to drive. Overall, the majority of parents really loved this Thomas the Tank Engine Ride-on Train Toy, and felt it was perfect for their toddler.